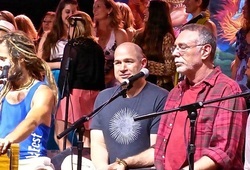 Dynamic, funky beats, fresh tracks, stellar musicianship and blissful chanting make Kirtan with Mike Cohen intoxicating and joyful. Join your community in an addictive musical experience that lifts your heart and keeps you smiling for days. Irresistible blends of Eastern mantra and Western grooves will leave you singing and dancing, energized and inspired!